1. In September 2008, nearly 2,000 people gathered in Accra, Ghana, for the Third High Level Forum on Aid Effectiveness (HLF). They represented a wide range o f development actors-low-income countries, middle-income countries, fragile states, donor countries, international aid organizations, global funds, civil society organizations, parliaments, media-but they were united by the goal o f improving the delivery and use o f development assistance. To move this agenda forward, they ended the HLF by endorsing the Accra Agenda for Action (AAA). 2. Purpose ofthis Paper. Over the last decade, the World Bank has been in the forefront o f the global aid effectiveness movement. With the OECD-DAC , the regional development banks, and the United Nations Development Programme, the Bank was active in convening and shaping the Accra HLF, and it played a prominent role in drafting and negotiating the AAA. It takes seriously i t s responsibility to fulfill the commitments it made in endorsing the AAA. The AAA i s an inclusive document, one that addresses concerns o f the diverse participants at the HLF. This paper provides a broad overview o f the evolving aid effectiveness agenda, highlighting areas critical to increasing the Bank’s development effectiveness. Responding to the request o f the Development Committee and the IDA Deputies, it also sets out an Action Plan to deepen the Bank’s progress over the next 12-18 months. 3 . Recent years have seen major growth in official development assistance-it nearly doubled between 2000 and 2007 (from $53 to $103 billion)’ and i s being provided by a growing number o f donors using a diversity o f channels and instruments. The international community has recognized that this aid fragmentation contributes to high transaction costs, weakens the accountability and ownership o f all development partners, and strains institutional capacity in developing countries. The aid effectiveness agenda has been the response to reform aid delivery and management systems and processes, which i s needed now more than ever with the onset o f the global financial and economic crisis. 4. The first HLF in Rome, in 2003, drew the development community’s attention to the issues o f harmonization and engaged high-level commitment to addressing them. The second HLF in Paris, in 2005, broadened the agenda to aid effectiveness and took a major step forward as both developing countries and donors3 endorsed the Paris Declaration on Aid Effectiveness, committing to specific actions-some with targets and indicators-and agreeing to monitor implementation o f those commitments. The third HLF in Accra marked a further step forward, with developing countries demonstrating significantly greater ownership o f the aid effectiveness agenda. Developing countries’ concerns heavily influenced the HLF agenda; developing countries’ representatives were part o f all decisions relating to the HLF, and served as discussion chairs and event speakers; and developing countries were full partners in the negotiations leading to the AAA. In other ways, too, the third HLF reflected changes: it involved a much wider range o f development actors (global funds, non-DAC donors, parliamentarians, civil society organizations) and drew attention to issues that have assumed increasing prominence, such as governance. 5. From the Paris Declaration to the AAA. The Paris Declaration highlights five agreed principles o f aid effectiveness-ownership, harmonization, alignment, managing – for results, and mutual accountability-translated into over 50 commitments. 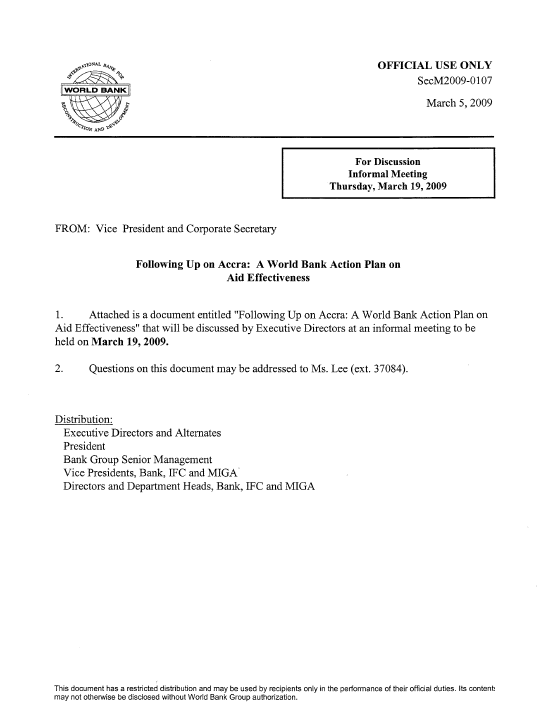 It i s underpinned by an internationally agreed process to monitor implementation progress toward targets set for 2010, through 12 quantitative indicators. Since 2005 it has helped define the aid effectiveness agenda and discourse at the country, institutional, and international levels. 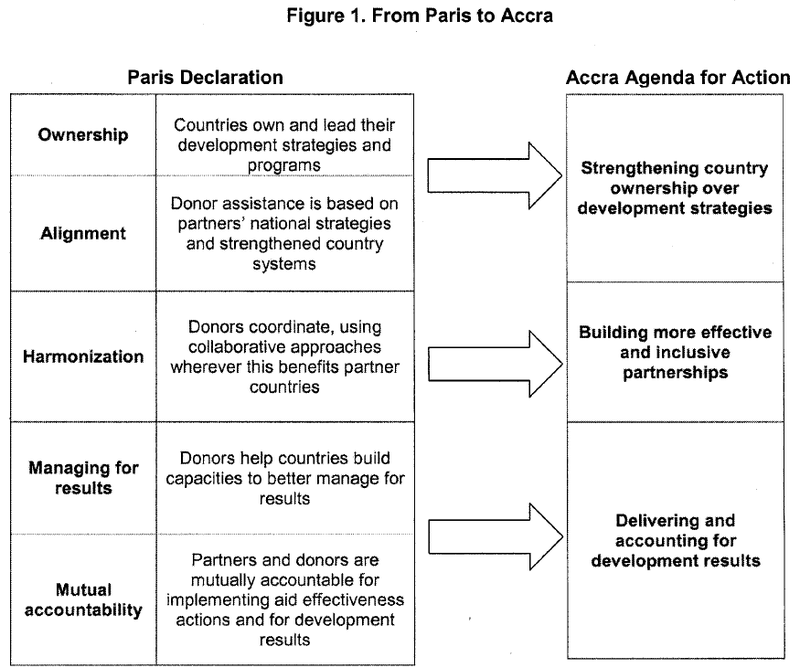 The AAA i s not a new Paris Declaration: the AAA reflects the evolution o f the aid effectiveness agenda and the changes in the international aid architecture since the Paris Declaration was endorsed (see Annex One: Accra Agenda for Action). Together, the Paris Declaration and the AAA substantively define the aid effectiveness framework for the international community as a whole (see Figure 1). 6. Focus ofthe AAA. The AAA builds on progress achieved to date on the aid effectiveness agenda and, reflecting the voice o f developing countries, i t goes beyond harmonization to focus more on strengthened country ownership and inclusive partnership. I t underscores mutual accountability4 for results and increased transparency by all partners. I t facilitates implementation of, and accelerates progress in, the aid effectiveness agenda by specifying concrete actions in many areas. translated into specific commitments such as: Use country systems as the first option; if not using country systems, transparently state the rationale for this and make clear under what circumstances they could be used. It also highlights the paramount need to support capacity development to enable countries to lead and manage development, and it acknowledges the critical role o f parliaments, civil society, and local government bodies in the development process.